Toby Thompson, from Mt. Sterling, conferred with his attorney, Kathryn Hapner, during a hearing Monday in which he admitted to smoking an illicit substance. The man reported that the substance he smoked was crack; a bag in the vehicle was found to have a small amount of heroin. Toby N. Thompson, 35, admitted Monday in court to smoking crack cocaine near anglers at Deer Creek Wildlife Area in Fayette County. The incident occurred in June of last year, when the Ohio Department of Natural Resources was watching anglers in the evening around the lake. State wildlife officer John Coffman reported June 12 that Thompson was sitting inside a van and appeared to be talking to an angler. When the angler walked away, Coffman said Thompson hunched over. “I could see Thompson moving around inside the van. I was watching from straight in front of the van through the windshield. Thompson was hunched over and I could not see him. When Thompson sat back up he had a clear straight pipe and a lighter in his hands. He looked through the windows towards the road then he ignited the lighter at the end of the pipe. He repeated the process two more times. I contacted Thompson after his third time of smoking from the pipe,” wrote Coffman in the report filed in the case. In another area of the vehicle, a small baggy was found that contained heroin, in an amount less than bulk, reports said. No additional crack cocaine was located, according to reports. Thompson was arrested and charged with possession of heroin, a fifth-degree felony, and illegal possession of drug paraphernalia, a misdemeanor of the fourth degree. 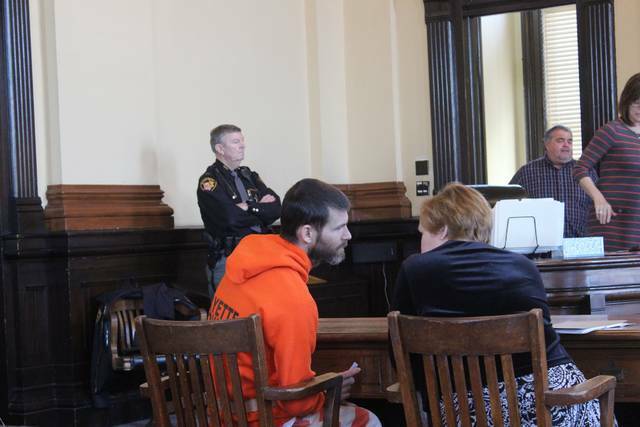 During court Monday, Thompson plead guilty to the charge of possession of heroin. His sentencing in the hearing is scheduled for April. Bond was amended to $2,500 own recognizance. Thompson will be assessed for mental health and drugs and alcohol use, according to the court. Thompson failed to appear to court previously on the charges for a November hearing. A warrant was issued for his arrest and he was subsequently charged with failure to appear. A separate charge of failure to appear, a fourth-degree felony, was filed against Thompson Dec. 8. — Scioto Paint Valley Mental Health Center, 1300 E. Paint St., Washington Court House, OH 43160. The phone number is 740-335-6935 and the crisis line is 740-335-7155. — Fayette Recovery, 5 Fayette Center, Washington Court House, OH 43160. The phone number is 740-335-8228. Ohioans may text the state crisis line for immediate help by sending the message ‘4hope’ to the number 741741 at any time. Contact Ashley at (740) 313-0355 or connect on Twitter by searching Twitter.com for @ashbunton.